figure (a) is entirely due to diffusion of holes from x=0 to x=L. coefficient of holes is 12 cm2/sec. (b) The velocity of holes in the n-region at x=0. 2. 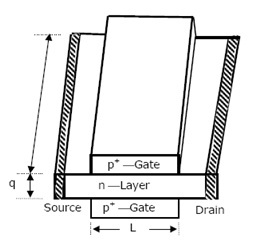 It is required to use a JFET of figure as linear resistor. W = 100 µm, L = µm, a = 2.5 µm. width of each junction due to the built in potential is 0.25 µm. The two P+ gate regions are connected together externally. The resistances of the regions outside the gate are negligible.